Pets and Their Owners Love Fox Hill! Although they didn’t know each other when they moved to Fox Hill in spring 2015, Ruth Tyler and June Farrell had several things in common. They both felt it was the right time to downsize from their homes of 40 years. They chose Fox Hill, in part, because it is a pet-friendly community, but they weren’t sure how their pets would react to living in a condominium. 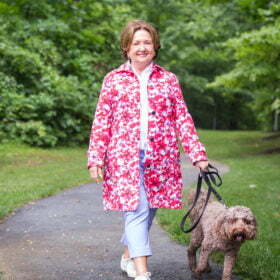 For June, finding a place where Jake, her Labradoodle, was welcome was “non-negotiable.” When she found a ground-floor condominium at Fox Hill with an outdoor exit, she didn’t let that prime opportunity slip away and put down a deposit immediately.